Autoart slot cars are slowly gathering in momentum and with each new model there comes one or two extra innovations or mainstream modifications. I’m not too sure where the company originates. Someone told me they were Japanese but I’ve a feeling they may well be South East Asia or Hong Kong based. As well as making a whole host of diecast models, they now produce a good selection of 1/32 and 1/24th scale slot cars and sets complete with track. They also sell 1/32 scale R/C models! As far as new ideas go, the GT3-RS is no exception. 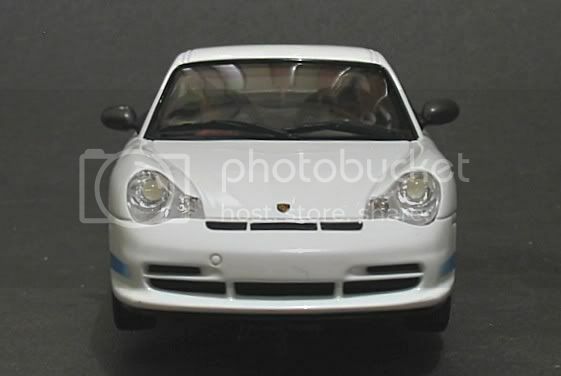 This model is a fine example of a car which has already been covered by several leading manufacturers. They have chosen the GT3-RS version which is quite striking in itself. The vast majority of model GT3’s are in racing livery. This alone is enough to distract the observer from the pure outline of the car and often, you won’t see the full beauty of this cars lines. 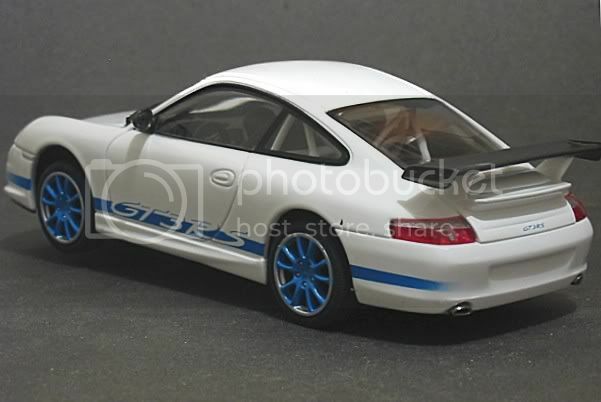 This Autoart model is a plain solid white with tasteful GT stripes along each side and the excellent alloy wheels are unusually finished too with the blue reaching the rim in alternate gaps in the spokes. Mirrors and rear spoiler are picked out in a kind of ‘gunmetal’ finish and the door mirrors are even silvered. Headlights are silvered and look very effective and the wipers have been picked out in delicate detail. Porsche’s badge, the Württemberg-Hohenzollern/Stuttgart coats of arms, is clearly decipherable at the front and a simple ‘GT3RS’ adorns the pale expanse at the rear. The model has a very crisp and clean exterior making other models look overly busy. Inside the model there are a pair of occupants who look very comfortable with their situation. 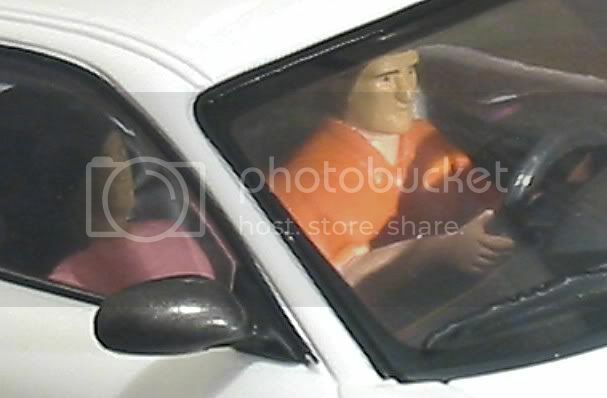 There is also a roll bar inside but shock horror, the occupants aren’t wearing their seat belts!! Another fine detail which shows the manufacturers art is based on auto modelling is the finely picked out detail of the dash and centre console. The gauges are in black with white numbers and even the gauge needles are picked out in red!! AUTOart have made this model a sidewinder which was not a bad choice. It allows greater realism as far as interior detail is concerned but I have to admit, that for out and out racing, I still prefer an in-line setup for better overall balance without having to add extra weight. With the body removed there are a couple of things which catch my eye. The first and most obvious is the plug on the light circuit. In itself not that unusual… ‘til you come to put the body back on! I have found this plug sits best behind the motor. 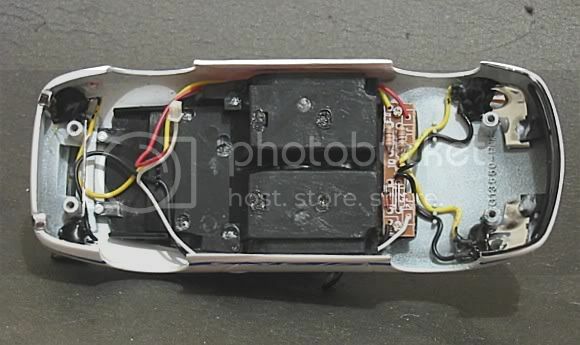 In front, the plug gets trapped and there isn’t enough clearance to get the body squarely back into position. Next are the twin, yes TWIN! traction magnets. 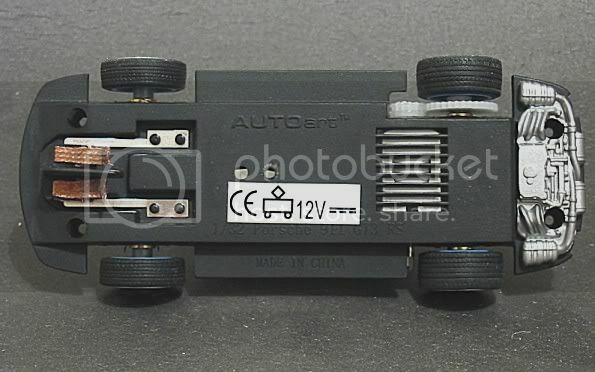 I would be first to admit I have levelled criticism against AUTOart’s traction magnets. Not because they are poor. 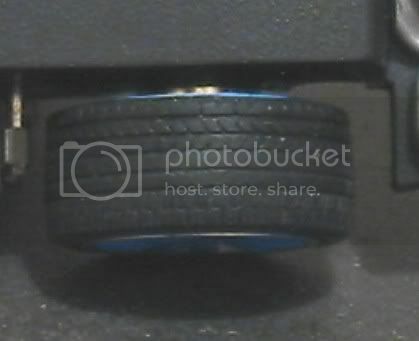 More because their models have a high centre of gravity comparatively and the magnet supplied in previous models has been inadequate when it comes to holding the model down. Well, sorry to say, but these magnets are at the other end of the scale. There is too much downforce now, causing the model to grunt off the line and I suspect somewhere down the line the motor will let me know this!! Which takes me to the third item. I was taken aback by the size of the pinion. It is noticeably large and the spur gear is noticeably thin!! In fact, the pinion has 14 teeth !! and the spur has 34 teeth. This gives it a final drive ratio of 34 : 14 or 2.428 : 1 !! Maybe the Carrera lesson hasn’t spilled over to Autoart yet? This will be its Achilles heel unless something can be done to rectify it. 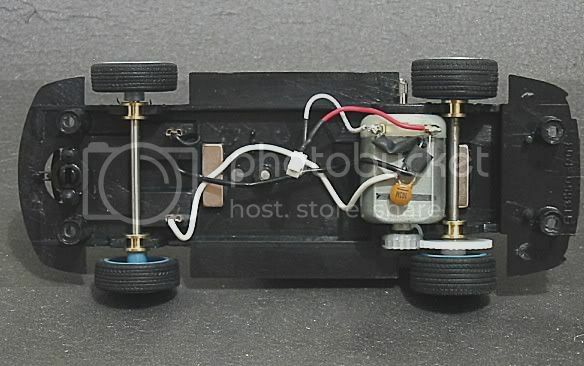 With the great variety of slotcar spares on the market now, I’m sure it wouldn’t be hard to fix it. The model comes with two spare guides which are 7mm deep! The braid material is a bit hard for my liking but two magnets should hold it down. I would put something softer in for board racing. The guide has suspension too. This is activated by two contact strips above it. A bit like the Scalextric system. Both the axles have brass bushes and there is minimal play in these. The front axle bushes have a couple of millimetres up and down play in them. Something I may well fix down. The tyres have been well modelled and the emphasis is obviously on scale rather than practicality. They are a good rubber compound and Autoart have faithfully reproduced the asymmetric tread patterns of the real thing. 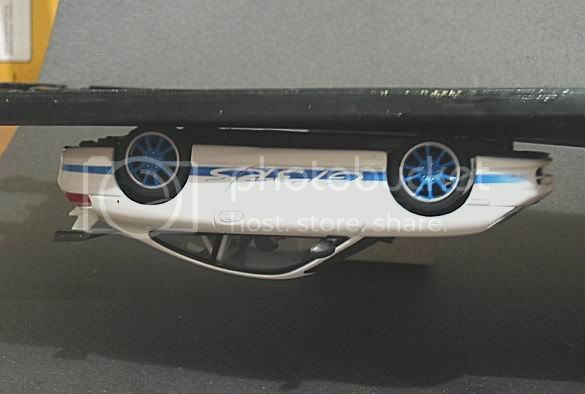 With the light circuit mounted up in the body and a fairly heavy body moulding, the tyres tend to dig in on a non magnet situation, causing the model to flip if pushed really hard. It will be interesting to see if fixing the front axle can prevent this! Lastly, the body sits very well on the chassis and running it with the screws slightly loose make this quiet car even quieter and makes corner acceleration and exit a bit more predictable but there is still some work left to do. On the (board) track the car runs well. It doesn’t bolt off the start line for gearing reasons and once rolling it is over geared enough to stop it doing silly things in corners. It will enter a corner confidently and leave respectably but there may well be other models passing it in the meantime. With its factory gearing this model needs straights at least four metres long and corners no tighter than a Scalextric outer curve plus a 25 ohm or less controller. 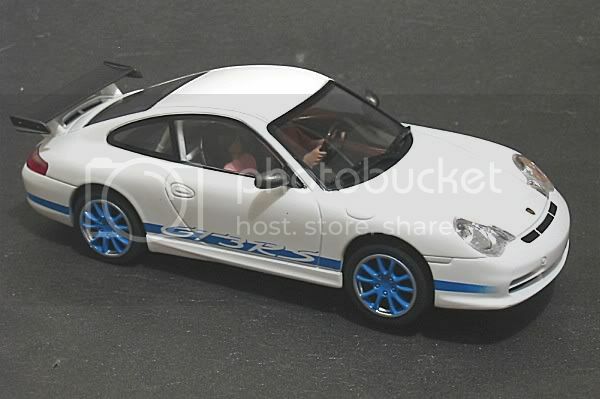 I had an opportunity to run it on the Four seasons 4 lane Carrera track with Parma economy 45 ohm controllers. My observation would be that this car is truly stuck down, even on Carrera! The down side is that the front tyres bind in corners causing the model to slow appreciably and requiring extremes of throttle movement to keep it moving. On the long back straight the car needed plenty of braking distance much like the early Carrera models . This will be caused by the high gear ratio. Apart from this the model still returned lap time of 7.2 secs. On a par with the Scalextric GT3’s. (Carrera DTM’s do 6.8’s out of the box). Front axle width			53.0 m.m. Rear axle width				54.5 m.m. Rear tyre dia. 20.0 m.m. Rear tyre width				8.50 m.m. Another beautiful car from Autoart but as with the rally cars, a bit off the pace for short track / home racing competition. This model still makes a great addition to any home racer’s stable. A sheer delight to behold and not that dusty on the track. Two of these would make a good race on timber but I suspect the front magnets would need to be down graded for plastic track racing. To my knowledge, this model also comes with red stripes and is also due for release as a track car.